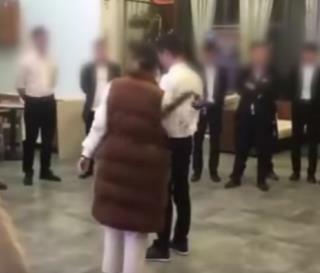 (Newser) – Sales staff at a home renovation company in the Chinese city of Zunyi had a choice: Meet their sales targets, or face punishments including being forced to eat cockroaches and drink urine. Police investigated the company after reports and video surfaced of the cruel and bizarre punishments, the BBC reports. According to reports on social media, underperforming staff at the company were also forced to drink toilet water or vinegar, have their heads shaved, or sell condoms on the street. Video posted online shows workers being hit with a belt and drinking cups of yellow liquid. A few DAYS in jail for this depraved, hideous, inhumane behavior? BOYCOTT this sick society! "as China's economy slows down." That's not just hilarious, it's REALLY HILARIOUS!!! They are just a bunch of scumbags anyway.